After our image-centric series kicked off earlier this month, lobobrandon wrote in to share his personal approach to creating custom images, which he wanted to share with the community. Lobobrandon utilizes pixaby to find public domain images, which he can use and alter without having to worry about attributions or special conditions, and edits them using paint.NET, which is a free graphics editor program. He sent over a couple of examples in which he has altered pixaby images with paint.NET. In every case, he altered baseline images to add a personal touch and to make them more relevant to the specific theme of a Hub. 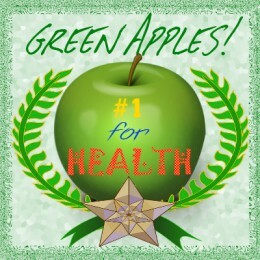 At right is an image from his Hub on the health benefits of green apples in which he showcases this basic approach. This one was created using a green apple, a star and the Roman wreath (don’t remember what it’s called exactly :D). Basically, I removed the background from them and merged them after creating the custom background (started with green color, pixelated it, then added a bit of blur). The borders are crated by using a single thick rectangle that I distorted. I did all this using the software paint.NET. What lobobrandon does is very simple and straightforward, and strikes me as a great way for folks who would like to customize their own images to start out. Thanks for sharing your tips, lobobrandon!